To quote my husband “this is the best barbecue I ever had!” Something like that is soooo good to hear! And it was really good. 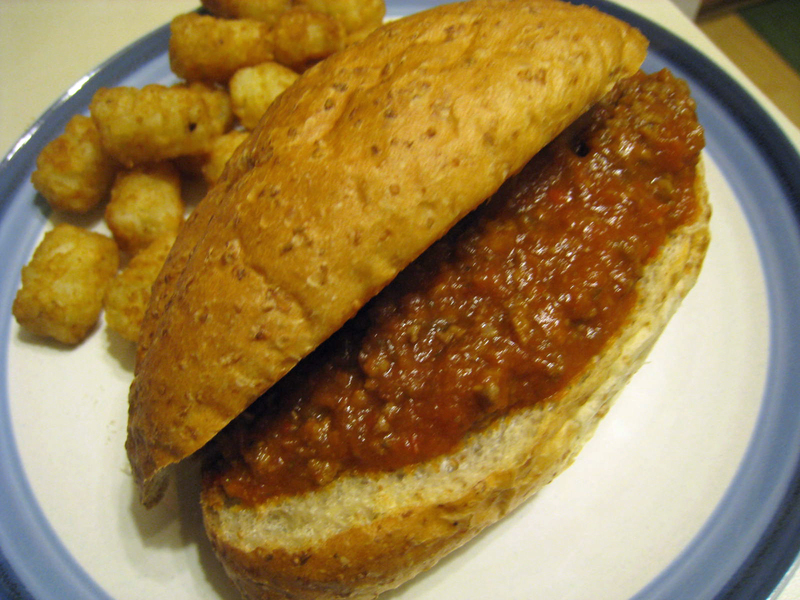 We were watching a rerun of Throwdown with Bobby Flay and the challenge was sloppy joes. I usually don’t make them since I would take the short cut and use a can of Manwich…which my husband tells me he hates. Interesting? So needless to say, I was quite shocked when he asked to put sloppy joes on the menu this week. This recipe is super simple but has a TON of flavor! It’s even better the second and third day! Brown meat in a large skillet. Drain grease and then remove meat and place into a bowl, set aside. In the same skillet, add the canola oil and add the onion, peppers, garlic and chili flakes. Cook on medium heat for about 7 minutes until tender and cooked through. In a larger pot, add the ketchup, tomatoes, tomato paste, Worcestershire sauce, vinegar, brown sugar and mix well. Add in the cooked vegetables and season with salt and pepper. Mix well. Cover and cook on medium low heat for about 15 minutes. Add the sauce to a food processor or blender and puree into a smooth sauce. Add the sauce back into the pot and reduce heat to low. Add the ground beef and stir. Serve on crusty rolls. Makes approximately 8 sandwiches.